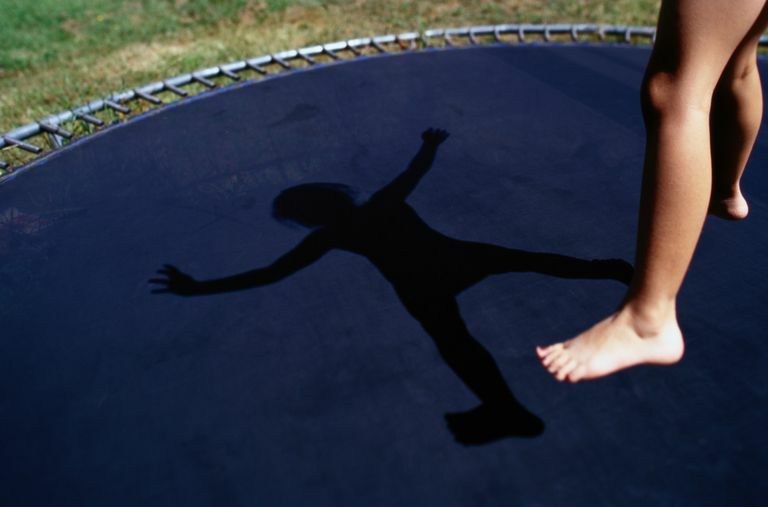 Your kids may be clamoring for a trampoline, but doctors say don't. Are trampolines safe for your backyard? The short answer is "No," at least according to the American Academy of Pediatrics (AAP). The AAP is the professional organization for pediatricians in the U.S, and it "strongly discourages" use of home trampolines. Trampoline injuries have actually been declining since 2004. However, when these injuries do happen, they can be severe. The most common trampoline-related injury is a sprained ankle; this isn't severe, but can be painful and will limit kids' participation in sports and other activities. Broken bones and dislocations are also a risk, especially for young children. An AAP data review showed that 29 percent of injuries in kids ages 6 to 17 were fractures or dislocations. But these accounted for almost half of the injuries among kids 5 and under. Most worrying is injuries to the head and neck, which make up 10 to 17 percent of all trampoline-related injuries and could result in paralysis or other permanent disability. Multiple simultaneous users: About three-fourths of trampoline injuries happen when multiple people were on the trampoline at the same time. The biggest risk is for little kids jumping with heavier or older children. These smaller participants are up to 14 times more likely to get hurt. Falls from the trampoline: Think safety netting solves this problem? Think again. It does not seem to have a significant effect on the rate of this kind of injury. There isn't enough research available to explain why, but it may be because safety enclosures aren't installed correctly, because kids climb on the netting, and/or because the enclosures can wear out quickly. Warranties for enclosure nets (and padding; see below) are usually shorter than warranties for other parts of the trampoline. Impact with frame and springs: As with nets, it seems that padding around a trampoline's frame and springs do not do enough to prevent injury. Even as the availability and use of padding have gone up, injuries haven't gone down. Again, this might be because padding wears out quickly. The AAP says commercial trampoline parks should follow the same safety guidelines it suggests for home trampolines. Research shows that as these parks are growing more popular, so are the number of injuries associated with them. And they are often more serious than injuries sustained on home trampolines. Trampolines are used in training for gymnastics, diving, figure skating, and freestyle skiing. This is the only use of trampolines that the AAP endorses, "as part of a structured training program with appropriate coaching, supervision, and safety measures in place." Such safety measures might include a safety belt or harness. What about mini-trampolines (also called rebounders)? The AAP does not take a position on these, perhaps because they are intended to be used by adults for fitness. And like the kid versions designed for indoor use, they are also low to the ground and sometimes have a safety handle. If you have a mini-trampoline at home, limit use to one person at a time and make sure the surrounding area is clear of any hard objects or surfaces. Only one person can jump at a time. NO somersaults or flips (these are among the most common causes of permanent, devastating spine injuries). Kids must be constantly, actively supervised by an adult. Homeowners should verify that their insurance policies cover trampoline-related claims. Make sure padding, netting, and the trampoline itself is in good condition and parts are replaced as needed. Trampolines should be set at ground level whenever possible, or on a level surface and in an area cleared of any surrounding hazards. American Academy of Pediatrics, Committee on Sports Medicine and Fitness: Trampoline Safety in Childhood and Adolescence. Pediatrics 2012;130(4); reaffirmed July 2015. Kasmire KE, Rogers SC, Sturm JJ, Trampoline park and Home Trampoline Injuries. Pediatrics e2016 1236.